Below is a post I put on Bali trip advisor forum I had so many wonderful replies and a lovely lady did buy and send the watch to me. I gave Riley the watch on his birthday and he was overwhelmed by the fact that someone who doesn't know us would do such a big favour. I sent the lady a message saying... I say "thank you so much" not just for the watch but for the gift of showing my kids how people can reach out and touch each other, that the world isn't full of terrorists and that people do still care about each other. My husband is leaving us... he is going on a wonderful adventure for thirteen months. It’s OK though he is coming back, but we will miss him terribly. Because of this we decided to have a family holiday we will never forget, the best holiday ever...and so we did!! We have two children, Riley and Tannalee, both of them had saved their own spending money for this trip. My daughter Tannalee turned 13 during our travels and with this new maturity came an amazing ability to shop. In Cambodia she wanted to buy everything and they loved her for it. By the time we got to Bali she was a professional, the stall holders might of respected her, but I don't think they loved her. Actually she did get a few hugs while being told how good she was at bargaining, it's as if they were proud of her!! On our homeward trip Tannalees bags were as full as her heart, along with all the wonderful memories she has trinkets and jewellery, sarongs and statues... she will never forget this trip! Riley is 15, the quieter of our two he didn’t find much to buy, but that's OK because he's not such a big shopper, he rarely wants anything. Life’s pretty cruisy with Ry and that's fine by me. By memory he bought a compass and a hammock in Cambodia and a few PC games in Bali. Near the end of our trip we met up with another family, their son is in Riley's class and they are firm friends. As a group we spend time in Ubud, then travel up to Pemuteran, our last few nights are spent in Saur where my story begins. We arrive in Sanur after dark and decide to walk up to the Bonsai Cafe for dinner, strolling along the beach path there is no one around. It's quite unsettling and we wonder if there has been some kind of drama we should know about? Stopping at the watch stall near Besakih I ask "where are all the tourist? ", "They are staying inside, lots of rain today" . There's no rain now, it is a perfect balmy night and we have the place to ourselves. The guys have started to look at the watches while I'm chatting, when suddenly both boys spot the same watch, at the same time! A strange looking creation by Franck Muller, none of us have ever heard of him, but on the back of the watch it states 'master of complication', so he must be good. What a wonderful phrase...'master of complications'. The boys decide it looks like something out of the animated film 'Steam Boy' and they both want it. No thank you we don't want to pay 800,000RP, how about 50,0000RP? "Oh! no can get for that price, its automatic!" Sure enough the guy who looks like someone’s favourite uncle shakes the watch and in the tiny circle at the bottom we can see the clock works start to move. OHO, he sees how excited the boys are by this, and won't go below 400,000RP. I tell the boys don't worry we'll see it around… but we don't. On our second last day Riley’s friend, who had first dibs because his hand touched it first (you know how it is) went and bought the watch for 300,000RP. Riley was very quiet for a long time. We walk back down the path in the heat to the see the watchman but he can’t get another one, he has actually already tried as he knew both boys wanted it. He shows us the same watch in another colour, but it looks completely different in black, somehow it loses its quirkiness. We walk all around Sanur but no one has anything like it. Ross and I who usually have the attitude of ‘deal with it’ (remember the monkey from Pemuteran, no?) decide we’ll take Riley on an adventure. The three of us get in a taxi and head off to the dreaded watch sellers in front of Matahari Kuta Square, too see what we can find. This was after all suppose to be the best holiday ever. We borrow ‘the watch’ from Rileys friend and take it with us. On the drive to Kuta we have fun trying to figure out how we can keep it, not really, I mean we wouldn't have really kept it. Riley might of, but we wouldn't let him. The taxi drops us off and as we make our way towards Matahari I am reminded why I don't like Kuta. I'm walking out in front of the boys alone, a guy slides up alongside of me "hey mama remember me?" yuk, yuk, yuk, those words just slipped out of his mouth like he was doing something dirty. Get me out of here, "Ross you walk at the front". Please who thinks up those bumper stickers? am I the only mother who dreads her children reading them? How about this one... ‘I F@#k midget amputees who have Down syndrome’ and that wasn't the worst one I saw. OK just keep on walking, we arrive at the first watch stall and I very carefully pull out 'the watch', at that moment it couldn't have been more precious if it was an original. I am so nervous that I'll lose it, or drop it. Yes, yes he has automatic! !...but it's nothing like 'the watch', “what about this one?" his hands run over the watches at the same speed that our eyes scan his display. He keeps on looking at our faces waiting to see if we react in the smallest way to a particular watch “this one? ", “no it has to be the same", “oh yes, this Rolex automatic”.. eventually he realises that we only want this exact watch "Oh no sorry". An elderly man who was standing nearby while we showed the first stall holder ‘the watch' waited politely and said nothing. As we move away he gestures with his arm towards another stand "yes I have”. I think “yeah sure you do, here we go” we follow his lead and Magic, he has one! I love how the stall holders don't try and take a sale from each other, how he had stood by even though he knew he had one and the first stall didn't and I love this guy for having one. Actually he had three of the same watch, in three different colours, happy days our holiday wouldn't end in tears after all! Riley buys the watch and then because we are so thankful, we try and find another to buy for the stall holders good luck. By this point even I have decided the Steam Boy watch is very cool and try and find a smaller version for my wrist. Unfortunately it all gets too pushy, about three other guys crowd around excited at the prospect of us spending more money, we grab our precious watch and head into Matahari. We spend maybe half an hour in Kuta, walking over to the rip curl shop where the three of us buy caps from the young, very uninterested shop assistants. I get a couple of T-shirts that I really love; we get in a taxi and are back in Sanur less than 2 hours after we left! Riley keeps on looking at his watch, “look mum there is a tiny spring, you can see it moving!” not without my glasses I can’t, it was worth the effort. The next morning Ry is singing in the shower, we aren’t checking out till 6pm so have a full day to shop and chill out. Ry has had a surf watch for the last 3 years so he’s a bit too relaxed about the whole situation. “Riley it’s a Bali watch, it’s not OK”. He starts to look worried when I point out the water droplets s on the inside of the glass face. I feel sick, I can’t believe we went to all that effort yesterday and now this, when you are on a real high the fall is always worse. The watch is held together with the tiniest screws you have ever seen, so while the rest of us sit down to breakfast Ross and Riley walk up to the Sanur watchman to ask if he can dry it out. They come back red faced and sweaty, it is probably the hottest day we have had in Bali and they don’t look happy. 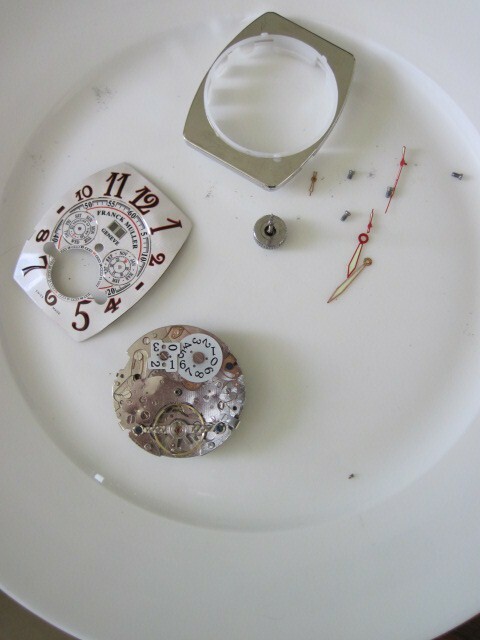 The guy who can fix it won’t be in till 11am by now the face has dried up and the watch is still working, we do take it back later he pulls it apart, wipes it a bit, blows on it and tells us it’s fine. He doesn’t charge us for drying it out even though we didn’t buy it off him, so of course we buy a Rolex off him. We spend the day shopping we even return to Kuta to show my girlfriend Matahari and Genevas where she walks around with her big grin telling me she’s in heaven! We are at home, I’ve spent the day putting all my new treasures around the house and eating white bread with Vegemite. Life is great, it’s hotter in Sydney than it was in Bali so Riley and I go for a swim we are floating around on our blow up rings when talk turns to our holiday, all of a sudden he throws up his arms and jumps out of the pool, OMG he was wearing the watch. Then this morning the watch has stopped, after all the dramas and the journey the watch took us on, not seeing the beat of the clock works moving feels like a little death has occurred. We told Ry that’s life and hope he has learnt a lesson, if that’s the end of it, so be it. Riley turns sixteen in May and by then Ross will be gone, I would love to surprise Ry with a working watch. So here we come to the “can I ask you a favour” part. If you see one would you get it for me? Of course I’ll send you the money before you send me the watch we paid 300,000RP, I’d pay a bit more if need be. We live in Sydney. Drama is that it has to be the exact same colour, white face with silver buttons, they came in gold and black but we didn’t like them. Mums going back in June (she should just move over there!) but I think if it’s old stock they might all be gone by then. I know there was one other the same at the main entrance to Matahari Kuta Square. If you can help please PM me.